New windows and doors in West Byfleet. Welcome to our West Byfleet showroom, situated on Old Woking Road just opposite Waitrose – it’s very easy to find! There is plenty of parking available outside opposite the showroom, as well as in and around the nearby streets. Recently re-furbished to accommodate our expanding range of home improvements, this showroom has the latest, on-trend products for you enjoy. Inside you’ll find a selection of uPVC double glazing windows, conservatories, patio doors, french doors, bi-fold doors, composite doors, uPVC front or back doors, fascias and soffits, guttering to bedrooms and kitchens all on display. Need new windows and doors in West Byfleet? Why not arrange a visit? Or even if you live local and you’re just passing by, our experienced sales staff in this showroom are always on hand, and are extremely helpful! Happy home-improving! Remember ‘buy local and buy safe’. 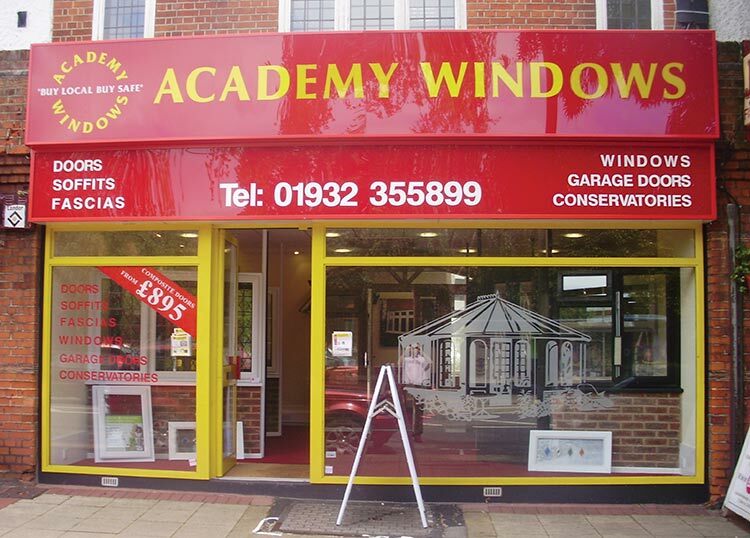 Yesterday we had two new windows installed by Academy windows. The two installers arrived promptly, and were courteous and efficient, and we were very pleased with the end result. Thank you Academy, and please pass our thanks on to the installers Mr Pugh and his colleague. I am always apprehensive about contractors working on the house as history has shown thatthey always fall short. The work to be carried out this time was to replace the soffits and guttering. Right from the start the agent at the West Byfleet office listened to my questions and responded in detail. This may sound rather simplistic but other suppliers for the same job kept pushing their own agenda to a point of anoyance. At the appointed start date and time a van with 2 fitters arrived, always a good sign, and started work immediately. They worked solidly and efficiently the whole time they were at the houseand fininshed the job on time. My regret is that I failed to get their names.